Plants usually annual, tufted, sometimes mat-forming via proliferating and arching inflorescences (stoloniferous), sometimes entirely vegetative; rhizomes absent. Culms often ascending or arching, quadrangular or broadly elliptic, 2-40 cm × 0.1-0.4(-0.6) mm, soft. Leaves: distal leaf sheaths persistent or disintegrating, pale brown, green or red-brown, streaked or mottled red-brown or purple, translucent, membranous, apex narrowly acute. Spikelets: basal spikelets absent; often proliferous, ovoid to ellipsoid or lanceoloid, terete, 2-10.7 × 1-2 mm, apex acute; proximal scale empty, persistent, amplexicaulous, dissimilar to floral scales, often longer, often resembling an involucral bract, ovate to lanceolate, midrib markedly thickened and broad and often prolonged beyond lamina; subproximal scale with flower; floral scales spiraled, colorless, whitish, or pale brown, streaked or mottled red-brown or purple, midribs green and red-brown or green and purple, ovate to elliptic, 0.8-1.5 × 0.4-0.8 mm, membranous, midrib obscure to prominent. Flowers: perianth bristles present or sometimes apparently absent; stamens 3; anthers 0.15-0.35; styles 3-fid. Achenes whitish to olive or pale brown, sometimes spotted olive or red-brown, obovoid, trigonous (or subterete), angles prominent, 0.55-0.8 × 0.3-0.5 mm, apex constricted proximal to tubercle, smooth. Tubercles green or pale brown to red-brown, trigonous. 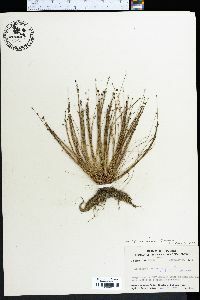 Specimens of Eleocharis brittonii and E. microcarpa without achenes are often difficult to distinguish. More detailed study of the four apparent entities across the two species is warranted. Annual herb, tufted or sometimes mat-forming 2 - 40 cm tall (may be longer in water) Leaves: reduced to bladeless sheaths, basal, two per culm, margins fused and enclosing culm, mottled or streaked with purple or reddish brown, membranous, translucent, with a narrowly pointed apex. Flowers: minute, spirally arranged on the axis of the spikelet, lacking sepals and petals, with zero or several bristles, subtended by a scale. Bristles (when present) half to nearly equal to the achene. Stamens three, exserted. Pistil one. Style three-cleft. Fruit: a one-seeded achene, white to olive to light brown, sometimes spotted, to about 1 mm long and 0.5 mm wide, reverse egg-shaped, constricted near tubercle, usually three-angled. Tubercle tiny, three-angled, depressed pyramidal. Seed with a thin, non-adherent wall. Culm: often arching to ascending, unbranched, soft, 2 - 40 cm long, to almost 0.5 mm wide, four-angled or widely elliptic in cross-section, enclosed basally by two fused sheaths. Spikelets: solitary, 2 - 11 mm long, 1 - 2 mm wide, egg-shaped to lance-shaped or oblong with a pointed apex, circular in cross-section, with a basal scale that is unlike to the floral scales. Basal scale often longer than floral scales, egg-shaped to lance-shaped, with a broad, thickened midrib that often extends beyond the apex. Scales spirally arranged and overlapping, 0.8 - 1.5 mm long, 0.4 - 0.8 mm wide, egg-shaped to elliptical, membranous. Habitat and ecology: Moist areas. Etymology: Eleocharis comes from the Greek words heleios, meaning "dwelling in a marsh," and charis, meaning grace. Microcarpa means tiny-fruited.